We are in the thick of the spring semester, and you have papers and projects underway. You may find that you could benefit from an hour or two of a workshop to gain some research skills or database finesse, for sources not strictly legal. All across campus, workshops are offered by various libraries at Cornell. Topics range from managing data sets to business research, from statistical databases to PowerPoint. You can also request a consultation with a research attorney for specialized legal research help by filling out this online form. As an associate editor of the Cornell International Law Journal and as an exchange student at the University of Amsterdam, there have been times when I have had to quickly familiarize myself with the substantive law of the European Union. With very little knowledge of the EU legal system, I relied heavily on law blogs to give me the background necessary to conduct research, cite court cases, and write an intelligible paper on an unfamiliar issue. Below are a couple of the sites that I have found to be very helpful jumping off points. One great website, geared toward students, academics, and professors, provides excellent summaries of recent cases: EU Law Blog. It also gives detailed background information, breaking down some of the more difficult concepts of EU law. The author cites to relevant case law often, and includes hyperlinks to official versions of the cases, making corroborating the information quick and easy. The only drawbacks of the website are that there is no information about the author, and occasionally the posts, though informative, sound politically charged. Additionally, the site is not comprehensive, in that you cannot find any and all European Court of Justice cases. However, the posts are categorized by subject matter, making searching simple. Although it is probably not a source to ultimately use as authority, it is a great tool in understanding a complex legal system. Another website that I found useful is the European Court of Justice Blog. This website is also not comprehensive, offering only a sampling of court cases, but the search function allows a user to sift quickly through relevant cases. For example, if you needed to learn more about the “free movement of goods,” one of the EU’s four freedoms, you can select that subject area under “labels,” which generates a list of appropriate cases. Each case description includes the background, the provisions of EU law at issue, the analysis of the case, and a link to the actual text of the judgment. Additionally, citations and links throughout make checking work much easier. A lawyer specializing in European administrative law oversees the postings on the blog, adding to the credibility of the information presented. Again, while probably not sufficient to use as a citation on its own, the blog provides very helpful information for someone unfamiliar with EU law. If you are going to be clerking for a judge or are considering clerking for a judge in any of the federal district courts or courts of appeal, the Almanac of the Federal Judiciary is a great place to learn about federal judges. The Almanac comes in two large binders and is filled with interesting information (it is not available electronically). Volume 1 is organized by circuit and covers all the judges in the district courts. The second volume covers all the circuit courts. The Almanac gives general information about judges from various sources, but relies heavily on information provided by judges to the Senate Judiciary Committee. Books and articles written by the judge are listed. Summaries or excerpts of testimony of judicial nominees or witnesses are supplied if of interest. Noteworthy Rulings, summaries of cases reported in the press and some recommended by the judges themselves, are included. In addition to coverage of cases, Media Coverage picks up other stories about the judges. 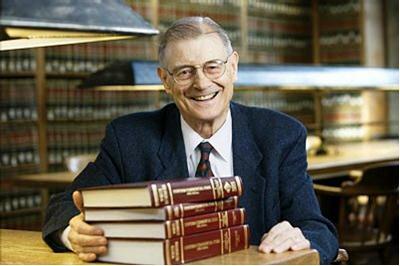 In addition to evaluations of appellate judges, Volume 2 gives Lawyer’s Comments on the various circuits overall. The Almanac is updated frequently to include newcomers to the bench. The Almanac also covers bankruptcy judges and magistrates. This helpful set is on reserve. Ask for it at the circulation desk, call number KF8775.A6 A44 1984. Take the library survey for a chance to win a carrel or gift card! The library wants to know what you think–about our space, our classes, our reference and circulation desks, and more. Your feedback is especially important now as the Law School prepares to undertake a redesign project to improve how the building meets your needs. It should take you 5-10 minutes to take the survey, which is available here. After you take the survey, you can enter a drawing for either a reserved study carrel for Fall semester 2011 or a $25 Cornell Store gift card. Thank you for your time and feedback. HeinOnline has earned its place as a comprehensive legal research tool. You probably use it for finding pdfs of journal articles when you have the citation. Over the last few years, it has developed its searching capabilities to be a first choice for searching journal articles. 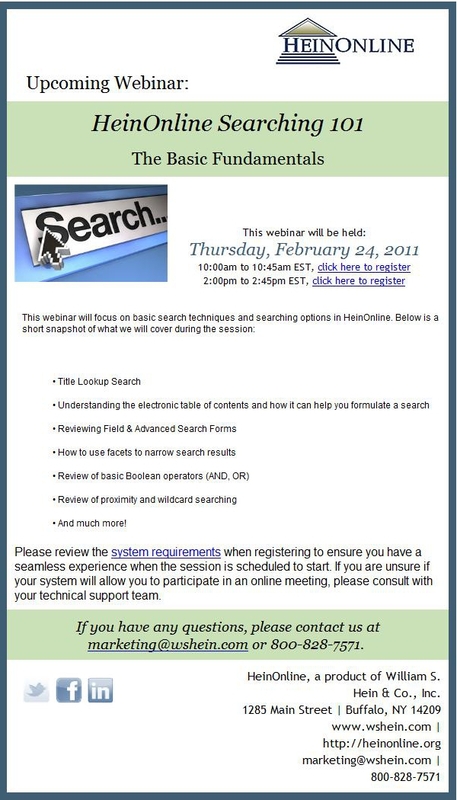 Hein is offering a 45-minute webinar on Thursday, February 24 at 10:00 am and at 2:00 pm on search techniques for HeinOnline. Sign up using the links below, and you can learn – right at your desktop — more strategies for improving your searches. To register for the 10:00 am session, click here. For the 2:00 pm session, click here. Google has been busily digitizing the world’s books since 2004. As of December 2010, some 15 million books have been digitized. A couple of months ago, Google Labs announced a new tool called Ngram Viewer that allows the user to analyze and graph word usage over time from a 500-billion-word subset of those 15 million books. Google has divided the 500-billion-word subset into a number of “corpora,” which allow you track usage of words and phrases in English, American English, British English, and a number of foreign languages including Spanish, French, and German. “English Fiction” is a particularly intriguing corpus. The most accurate data are for English-language materials published between 1800 and 2000. Ngram Viewer makes it possible to track the early appearances of a word or phrase (like “laptop”) in published books, but it’s even more interesting to compare the ascending and descending usage of two or more words or phrases (like “laptop” and “mainframe”) on the same graph. 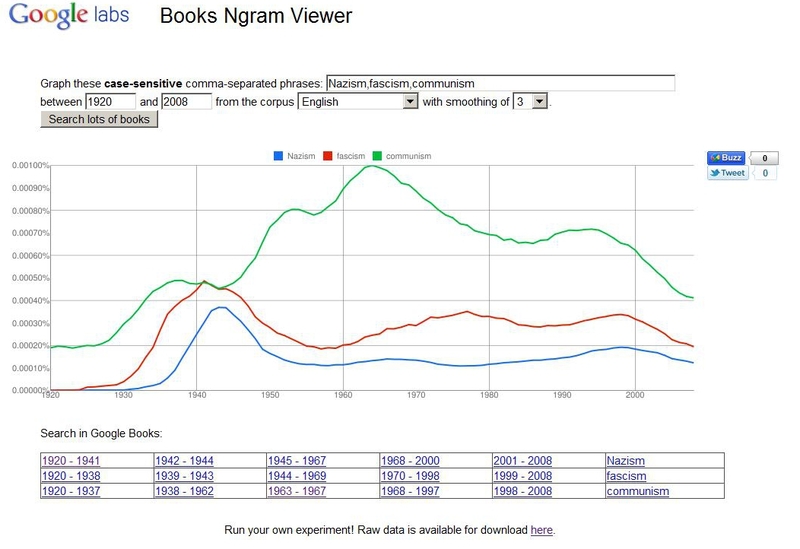 The graph below compares the usage of the words “Nazism,” “fascism,” and “communism” in English-language works published between 1920 and 2008. Not unexpectedly, usage of “Nazism” and “fascism” peaks in the 1940s, while usage of “communism” reaches an apex around the time of the Cuban Missile Crisis (1962). Beneath the graph is a series of year ranges corresponding to each search term entered into Ngram Viewer; clicking on a range runs a search in Google Books for publications within that range of years that include the search term(s) in question. Click on the image below to enlarge it. Ngram Viewer is fun and easy to use. Once you start experimenting with it, it’s hard to stop! More detailed information about Ngram Viewer is available at http://ngrams.googlelabs.com/info. To see an interesting collection of Ngrams submitted by users, go to http://ngrams.tumblr.com/. What is research at a summer job like? In October, the Law Library ran its annual Student Summer Research Survey for 2010. Close to 100 upper-division students responded to the survey for which the Library is most grateful. There are some interesting highlights that we’d like to share. First, the split in employer types broke down roughly into fifths, with 22% at larger firms, 20% at smaller firms, 19% clerking for judges, and 23% working for government. Twelve per cent of respondents worked in public interest. Research was a major work duty with 59% spending at least half their work time on research. A statistic 1Ls may want to ponder as they consider the skills they will need for their summer work. Lexis and Westlaw were commonly available, but 15% of the respondents did not have employer-provided Wexis. Other online resources used included Fastcase, BNA, CCH, HeinOnline, Google Scholar, PACER, and other government web sites. Pay-as-you go pricing plans for Wexis are still common with 30% of Lexis users having transactional/hourly pricing and 43% of Westlaw users on such plans. Almost 1/3 of respondents said their employers had a policy on minimizing research costs, including requiring approval to use online subscription sources, and specification of cost-saving techniques and low-cost sources to be used first. While Wexis and other online sources dominate, print is not yet dead with an overall 22% of research work being done in hard copy sources. Eighty-one per cent of 2Ls believed that the research component of Lawyering did help prepare them for summer work. Of course, there were many useful comments on this point. Overall, 91% of respondents said they were prepared for their research duties. To the extent that they were not prepared, half said the Law Library should improve the research component of Lawyering and 20% said to offer more advanced/specialized research courses. Again, the Law Library greatly appreciates all those who participated in the survey and congratulates the prize winners, Emily Pickering and Chris Wild. As one can see, the information gleaned from the survey is useful in charting the course of research instruction at Cornell Law School. I wish also to express my profound gratitude and appreciation … to the excellent librarians, without whom naught! I’m a book worm and those librarians have satisfied the appetite of that worm in a most remarkable way. And sometimes I fear the librarians don’t get quite their due and I want to emphasize their importance. And for a good many years I not only was heavily engaged in supporting our librarians here but I was chair of the Cornell University Library board. And we did our best to get people in line to support the Library budget and to support the efforts of the librarians to make the campus conscious of the profound importance of those libraries. We just tend too often to take all those books on those shelves for granted. Let me tell you there’s a lot of work behind that, a lot of careful attention behind that, and much gratitude is due. We can use your input: Cornell Law Library is a Federal Depository Library, officially designated to have U.S. federal documents and information for you, the university, and the community. Primarily, we receive the law-related materials, such as U.S. Reports, the official U.S. Code, the Code of Federal Regulations, etc. We are obligated to organize and help you use the materials, in print and on the web, which come to us at no charge. The Federal Depository Library Program (FDLP) is conducting a web survey this month to learn what you think of the value of the program. The survey is at http://www.surveymonkey.com/s/HSLCRRB and is available until February 28, 2011. At the conclusion of the survey we will receive a report with aggregated responses and comments from our Law Library users, which will be used to help us determine the value of the FDLP here and to facilitate the development of outcomes-based performance measures. If we are doing our jobs well, the federal documents will be a seamless part of the Cornell Law Library collection and services. Our aim is to integrate the federal documents with all the other materials in the library. You are encouraged to complete the web survey and let us know how we are doing! If you are a 2L or a 3L and want to have access to one of the premier databases for company information and news, in addition to legal information, stop by Alcove 43 in the Reading Room on Monday, Feb. 7 and meet with our Bloomberg representative. Pamela Haahr will be handing out passwords and providing individual instruction on how to use Bloomberg Law. 2Ls will be able to take Bloomberg Law with them to their summer employment because their passwords will remain active over the summer, unlike Lexis and Westlaw passwords. Pamela will also have “give-aways” for interested students.